Did You Know That Vanilla Beans Come From Orchids? Vanilla is the fruit of an orchid plant, which grows in the form of a bean pod. Although there are over 110 varieties of vanilla orchids, only one, Vanilla planifolia, produces the fruit which gives us 99 percent of commercial vanilla. Another genus, the Vanilla tahitensis grown in Tahiti, does produce fruit with a more pronounced aroma, but debatedly less flavor. Vanilla orchids are grown in tropic climates, primarily Mexico, Tahiti, Madagascar, Reunion, Mauritius, Comoro, Indonesia, Uganda, and Tongo, with three-fourths of the world's supply coming from Madagascar. In order to produce the fruit, the orchid flowers are laboriously hand-pollinated at a very specific time of the day when the flowers are open during a short one-month flowering period. The fruit is not permitted to fully-ripen, since this will cause the beans to split, thus losing commercial value. Hand-harvesting occurs four to six months after the fruit appears on the vines. Once harvested, the green beans go through a treatment process lasting another six months where the beans are soaked in hot water, rolled in blankets to "sweat," dried on flats in the sun to evaporate the water, and then stored in a ventilated room to slowly ferment and produce their unique aroma and flavor. Quality and aroma of the vanillin flavor varies by growth location, since some areas produce beans with higher vanillin content. 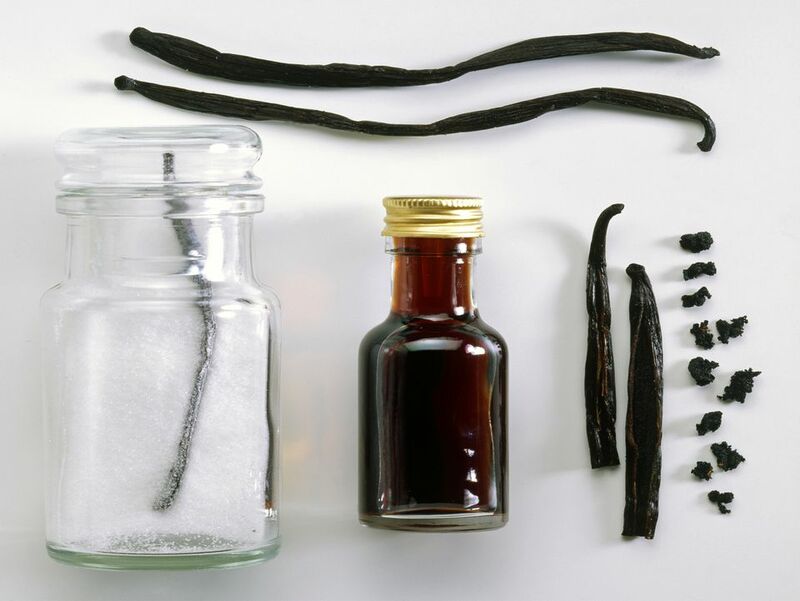 The resulting dark brown vanilla bean is usually 7 to 9 inches long, weighs about 5 grams and yields about 1/2 teaspoon of seeds. One-quarter teaspoon should be enough to flavor a recipe for 4 to 5 people.